Lessons from Wildfires of Yore – the Perennial Blame Game: Who Started the Fires? 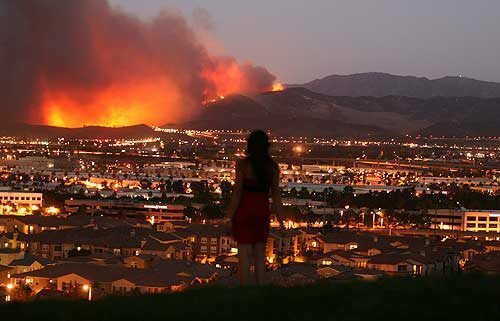 San Diego fires in May 2010. Blaming arsonists for Southern California wildfires has always been a great game for politicians and the mainstream media. Before the Wildfires of October 2007 were through burning, the blame game had begun. TV news crews speculated on the causes during those first few days when it seemed the whole world was on fire. Early on, immigrants were the cause, then definitely arsonists, then the homeless, then it was little boys playing with matches. There were so many fires in San Diego County and throughout Southern California that sprang up in the space of just a few days, that there just had to be some kind of conspiracy out there, lighting these fires! There were credible reports of a few of the fires up in the LA area being started by arsonists and/or small boys with matches. There was talk, locally, of evidence found that the Harris Ranch fire grew from an immigrant’s campfire. Newsweek magazine, ran a 3-page article on the mindset of arsonists in Southern California (but not a paragraph on over-development or power lines). Finally, in a series of articles on the causes of the fires on November 10th and 11th, the San Diego Union Tribune informed us that the causes of at least the Rice fire and the Witch Creek fire were the power lines of San Diego Gas & Electric, our ubiquitous utility company. In the high winds, measured from 60 to 100 mph, the power lines would arc and send sparks flying to nearby trees. Gary Eidsmore, a fire investigator, told the Union Tribune, that it is his understanding that most of the fires were caused by power lines arcing or falling down in high winds, or transformers exploding. The Witch Creek fire, for example, began directly beneath 69-kilo-volt electric transmission lines, located on a ranch south of SR-78 and just west of Santa Ysabel. It burned to Rancho Santa Fe, and populations were evacuated all the way to the coast. The exceptions to that were the Harris Ranch fire — most likely started by a migrant campfire one mile east of Potrero, the Poomacha fire which began in a house on the La Jolla Indian Reservation, and several of the Pendleton fires that were connected to causes related to vehicles. Blaming arsonists for Southern California wildfires has always been a great game for politicians and the mainstream media. In social historian Mike Davis’ “Ecology of Fear”, a seminal book he penned after the wildfires — and other natural disasters — of the mid-1990s struck Los Angeles and Malibu, he devoted an entire section of one of his chapters, “The Incendiary ‘Other'”, to a discussion of who is blamed for wildfires in our region. Arsonists are also the favorite of many media-oriented politicians. In efforts to toughen their image, politicians call for ever more punishments for arsonists. Then Gov. Pete Wilson, in 1993, compared arson with child molestation, and proposed life sentences for those found guilty. Other right-wing Republican legislators called for the death penalty for instigators of fatal fires, and even one year prison terms for those who cause fires accidentally. Fire investigators and the media jump on the arsonist-is-to-blame bandwagon. In the mid-nineties, federal agents of the AFT joined local authorities to search for the arsonists who supposedly started 19 of the 26 mid-nineties wildfires. Davis understands that this “paradigm shift” has been going on for some time in Southern California, as it has been the conventional wisdom for generations. Although probably not more than one in eight blazes is caused by arson, Anglo-Californians have always criminalized the problem of mountain wildfire. The majority have never accepted the natural role or inevitability of the chaparral fire cycle. … Political as distinct from scientific discourse has long been obsessed with identifying an “incendiary Other” responsible for fire destruction. The mask of the “incendiary Other” has been changing over the years, depending on who is on the official scofflaw list. In the early twentieth century, this “cruel-hearted and selfish man” … was portrayed as an Indian, a sheep-herder, or most frequently, a tramp. During the First World War, the Wobblies (Industrial Workers of the World) were believed to be lurking behind every burning bush in California. A decade later, major wildfires – like the 1930 Decker Canyon blaze – were usually blamed on itinerant farmworkers, especially the Okies. Years later, the great Los Angeles arson manhunt from the mid-nineties had fizzled out in “a maze of false leads, misidentifications, minor arrests, and interagency squabbles.” A genuine breakthrough of the cause of the fires in LA didn’t occur until the fall of 1997, when the California Department of Forestry chief counsel identified the “arsonist” — it was none other than Southern California Edison. The utility’s negligent power-line maintenance was responsible for six of the blazes in the LA area, including the 1996 Malibu fire that injured 11 residents and firefighters. SCE’s offices had to be raided by authorities because the utility refused to cooperate with state investigators, and they were accused of deliberately withholding, tampering with, and destroying critical evidence that connected their negligence with those fires. But beyond looking at utility power lines as the culprit and the power companies’ negligence in maintaining their lines — as all that is very obvious and predictable — and definitely needs to be addressed, we must look at the larger picture, as we know all too well that we will again have Santa Ana winds, and a drought-plagued environment. In the end, Southern Californians must look to ourselves, not to some “other” as the instigator of the wildfires. It is we, not the arsonist or immigrant, who allow urbanization into firezones. It is we who elect representatives who enable this type of development by their policies; and it is we who springboard politicians into office who disavow any additional taxes or resources to build up our fire fighting capabilities and who continue the myths of who’s to blame for the fires. We are the responsible ones, no matter what our distance from the centers of power, because afterall, it is we who are accountable for this land — a land that we must share with the rest of our natural habitat. Where’s that mirror? We have found the “arsonist”, and it is us. Interesting retrospective. The arson suspect keeps changing but the the fires remain the same. Seems that there is almost never someone prosecuted. One notable exception was the Los Padres fire in the sixties. It was started by a tweaker who let his truck overheat and burned hundreds of acres. I think the guy’s name was Johnny Cash or something. Well, I personally, am still angry about the FIFTY MILLION DOLLARS squandered by our elected officials, for the Water Feature/Park at the county building. Couldn’t that money have been put to a better use, especially considering we have had so many major wildfires and are at great risk to many more in the near future?